On Aug. 26-27, Professionals Empowering Sustaining and Transforming (P.E.S.T.) 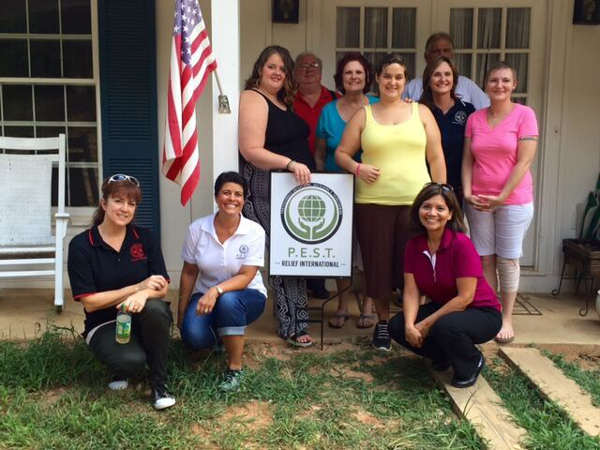 Relief International and the Certified Pest Control Operators of Georgia (CPCO) partnered to bring comfort and relief to two women’s recovery centers. The weekend event was part of the REST Initiative: making shelters and group homes a more sanitary and comfortable place to sleep. Their project began on Friday with the installation of 27 mattress encasements and SenSci Volcano Bed Bug Detectors donated by Mattress Safe and BedBug Central, respectively. CPCO enlisted its board of directors along with other volunteers to encase the mattresses and place the detectors around the facility. On Saturday, CPCO partnered with P.E.S.T. Relief International and Mattress Safe to combine education and service together in one day. The morning kicked off at 9 a.m. with a two-hour HPC Bed Bug Training followed by a workday at Abba House to further the efforts of the REST Initiative. A team of 37 P.E.S.T. Relief Responders consisting of pest management professionals (PMPs) and distributors from Georgia, North Carolina and California joined their efforts. Exclusion repair, electrical repair, termite treatments, bed bug prevention, lawn care, and painting were offered to a recovery program for women who are breaking free from addiction. Many of the living areas that were old and tattered were transformed into a safe and beautiful environment for the residents.